Some postcards arrive late. In August Nauli has travelled to Athens for a very short trip, just to get a bit of the heat and feel the magic of great memories. Because summer was so cold and rainy all the time... Athens was too hot for the beach, too hot for going up to Akroplis, but just right to fill us with sunshine! 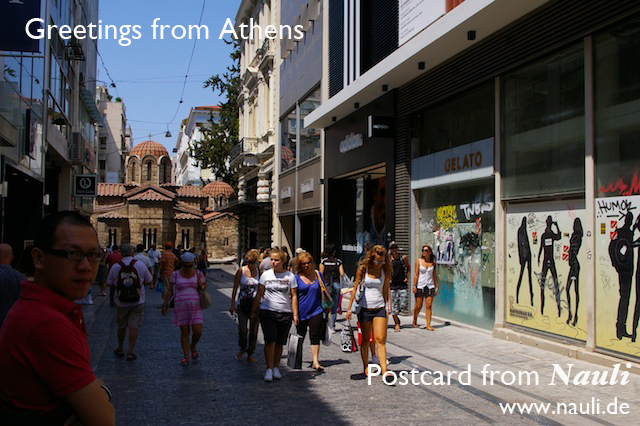 And yes, we highly recommend to visit Akropolis and the museum! Lucky us, we have been there before, so just hanging up with tasty Greece food and tons of water after having a walk through the city was fine for us. Happy to see, that this Church in the inner city is open to visit now after years of renovation. Manche Postkarten kommen spät. Im August war Nauli in Athen um ein bisschen Hitze und die Magie wunderschöner Erinnerungen zu spüren. Der Sommer in Deutschland war kalt und regnerisch... Athen war zu heiß für den Strand, zu heiß um zur Akropolis hochzulaufen, aber genau richtig um Sonnenschein zu tanken! Und natürlich empfehlen wir einen Besuch der Akropolis und des Museums! Wir waren zum Glück schon mal dort und so waren wir einfach glücklich mit leckerem griechischem Essen und Tonnen von Wasser nach einem Spaziergang durch die City. Schön, dass diese Kirche in der Innenstadt nach Jahren wieder für Publikum zugänglich ist. Sad to see, that so many shops are closed and buildings not selling. We wish all our Greece friends the best! We are coming back for sure! Traurig, dass so viele Geschäfte geschlossen haben, so viele Büros und Ladenlokale sich nicht vermieten lassen. Wir wünschen unseren Griechischen Freunden alles Gute! Wir kommen sicher wieder!